I need to remind you that this Waraku is not the same as Pasta de Waraku though they’re products of a certain company from Singapore and available for franchise. Pasta de Waraku franchise right was bought by Ismaya Group, but for this Waraku I have no idea. Well, it’s as if that important and already too many ‘Waraku’ words mentioned so it gets annoying. But however, this new installment in Grand Indonesia seemed to be interesting since they have the same attractions in front of the joint similar with Pasta de Waraku, attractive and colorful foods made out of wax I suppose. 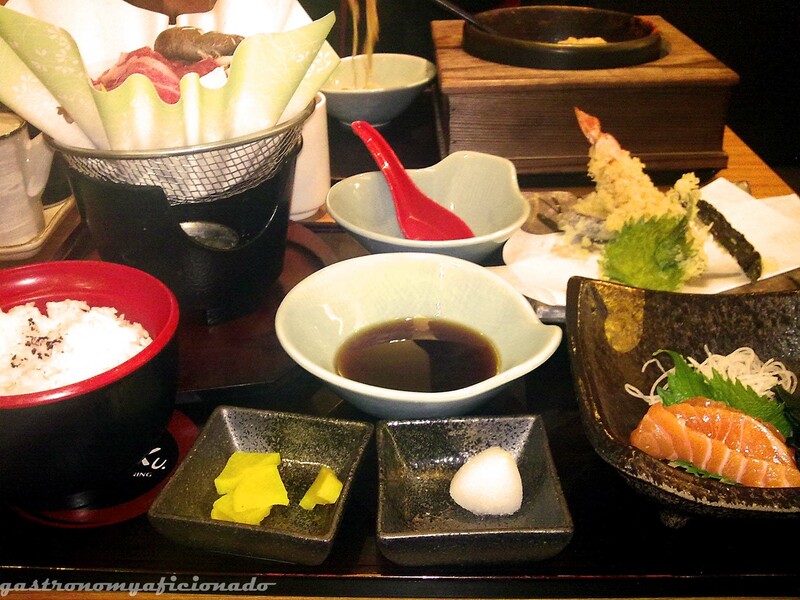 We browsed the menu first and they got almost everything from Japanese dishes! Including some of those I haven’t seen before. After further deliberations, we decided to try it out. Once inside, it’s not really Japanese anymore. Well, Pasta de Waraku was not that Japanese style interior restaurant also but much cozier. I don’t really like this place, it’s too open (I prefer a warm atmosphere no matter how busy the place is) and I can’t get myself along with the place. I got this so-called chemistry between me and the place. It’s different if it’s a hawker, but if you own a permanent place and you got like the whole money in the world then make it so! Make the food genre you offer get along with your place. It’s like nowadays KFC, I hate the place and I hate the fact that they promote newbie bands with their annoying music and it disturbs you a lot while you’re eating there. I know it’s only a fast food chain, but those facts really bother me a lot and I prefer to take my meals back home. Whan an extensive menu they had there! So I was looking for a somewhat rare dish that not every Japanese restaurant in Jakarta can offer. For instance, it’s rare to find kamameshi or an unagi yanagawa dishes and certainly not in the famous joints like Sushi Tei or Sushi Groove! Since ma cherie wanted a bowl of ramen, therefore I suggested her a strange variant of it, Ishiyaki Chige Ramen (IDR 49,800). Whilst I, took a serious interest about this new wonder for me, a kaminabe dish. 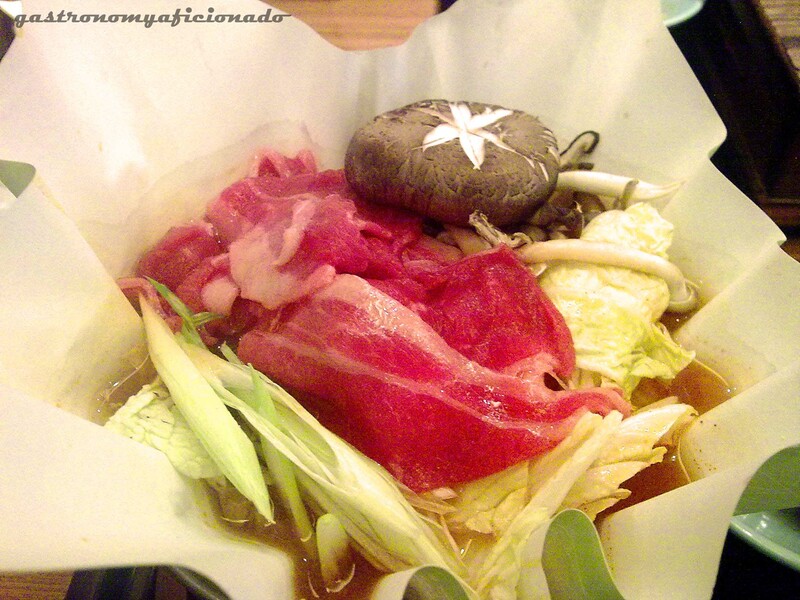 Kaminabe is one from many nabemono dishes, a soup with many ingredients from meat, seafood, and veggies in a hotpot usually made from cast iron or clay. But this kaminabe is different, instead from a cast iron or clay, it’s made up from a paper! You can also pick from 3 kinds of broth. It was wafuu, chige, and miso. I chose chige and the waitress said it was made from beef broth. Straight to the taste, this kaminabe was surprisingly good and has the ability to keep the food warm and even hot at some stage! It’s lit up with fire until it extinguishes itself eventually. I picked the Kaminabe Wazen (IDR 88,000), using the meat and veggies only but you can pick the seafood version if you want to. This set comes with tempura and sashimi so I can taste a glimpse of the other dishes. Well, next time I’d pick the kaminabe only since the rest was just so-so. While my partner’s ramen was quite good at first with the squids and the egg helping the taste of the spicy chige broth, but the taste declines as time goes by and she even tucked in on my dish instead. I’m not putting the picture of this ramen also since it resembles Indomie with egg a lot! Haha..
Well, it’s a good place to try many dishes of Japanese cuisine in the same place, but I didn’t feel like at home no matter how Japanese the dishes might be. I also particularly feel that the kitchen wasn’t ran by a Japanese chef though I haven’t got any clue though for this ‘accusation’. Anyway, it’s a decent place for beginners and for those who haven’t tried a kaminabe like me for instance. As for the rest, I pronounce.. Average. No matter how casual the theme, it’s just too bland to see..
Quite helpful, though one of them had said that using Debit Card was accepted but turned out that it’s not allowed. What the! The kaminabe was great, but the ramen did not meet my standard. I assume the rest might be doomed for that also.